Essential plot rundown: Two judges must survive after being sealed in a gang controlled building. So, if you have seen the trailer for this, you will immediately see that it looks exactly like The Raid: Redemption. (And that's assuming that you have seen the trailer for that one too). And yes, these movies are super similar; the core idea is identical. But, each movie is it's own. And Dredd 3D was an awesome movie. It was basically everything the trailer made it out to be. The world that is created here is very interesting. Most of the movie takes place in one giant building, but there is a little intro and outro that sets the world we are entering. It 's your typical giant, rundown city, but I thought they did a good job creating it. I also liked how the judges were portrayed. The judges are every part of the justice system: judge, jury, and executioner. And I liked how it showed them going through all of those phases when interacting with criminals. They would look at someone, list of their crimes and then state the verdict. It made them feel like real people. In a lot of action movies the good guys just shoot the bad guys (well, they do do that here too). But, in this world of Mega-City One, these judges have their rules they follow. I thought all of the acting was pretty good. I was a little worried after seeing that Olivia Thirlby was in the movie. But she did a fairly decent job. 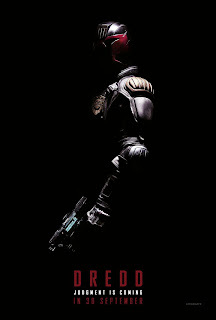 Karl Urban was good as Judge Dredd. Though, at times it sounds like he's trying to pull a Christian Bale; but, according to the internet, he's going for a Clint Eastwood feel. But, the best was probably Lena Headey as the main crime boss. She totally took that role and made it hers. where there is water, blood or smoke flinging through the air in slow motion and it looks really gorgeous. Couple that with the 3D and it's nigh poetic. However, these things also created some complaints. Whenever somebody drugs up and slows down, everything brightens up. I don't know if it was an aesthetic decision or if it had to do with them filming at that speed, but it looked weird. Also, there were a lot of times where the image looked grainy. Not film stock grainy, but filmed with really low light and then fixed in post grainy. And then the 3D made it pop out a little. Dredd also has a paranormal element to it. And, when it was first introduced, I was rolling my eyes. Great, now it's going to get cheesy on me. But luckily, it wasn't as bad as I was expecting, and actually had some cool moments. Like I said earlier, this movie is really similar to The Raid. So, when I went to see it, I was expecting the same intense, fast paced movie. But, that's not what I got. It's still a solid action movie, but not as fierce as The Raid; so I was slightly disappointed at first. 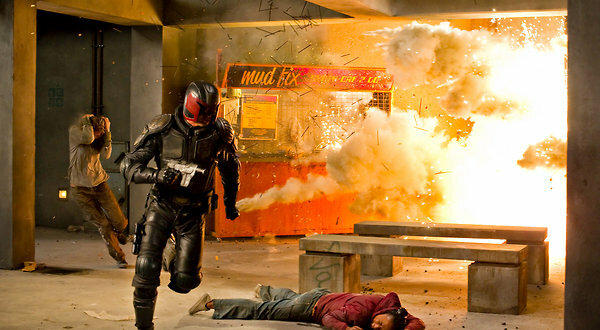 But, like The Raid, Dredd 3D is extremely violent, brutal and bloody. Definitely not for the weak stomached. But overall, it is a really good movie. And it makes me sad that it only opened at number 6 at the Box Office. It has a solid story, good acting and amazing visuals with the 3D and slo-mo. I thought it was everything it needed to be.